Few television series have been quite as significant as The Simpsons. Having had its 31st and 32nd seasons recently green-lit, the latter of which will include the 700th episode, the animated sitcom from Fox is the longest running sitcom in history, and the titular yellow family have become some of the most instantly recognisable fictional characters of all time in the past thirty years. Even if you have never watched an episode then you are sure to have seen merchandise and advertising for the series. What is most impressive about this is the fact that it has come to this place from relatively humble origins. For three seasons of The Tracey Ullman Show, Matt Groening’s cartoon creations featured in roughly animated shorts before eventually being developed into a half-hour prime time series. Commissioned for a thirteen-episode season, the dysfunctional family made their debut on December 17, 1989, in the episode Simpsons Roasting on an Open Fire. The Simpsons are a lower-middle-class family in the town of Springfield that consists of dim-witted, beer-loving father Homer, sheltered housewife Marge and their three children – class clown Bart, A-Grade student Lisa and baby Maggie. While the first season primarily focused on the family dynamic, with all family members taking centre stage at least once and several episodes focusing on Homer and Marge’s marriage, multiple minor characters (who would later go on to be prominent supporting players) are first introduced and incorporated into the self-contained narratives. These include extended family (Grampa Simpson and Marge’s older sisters – twins Patty and Selma), Homer’s cold boss (Mr. Burns), his colleagues at the Nuclear Power Plant and fellow barflies at Moe’s Tavern, the staff and students at Bart and Lisa’s Elementary School, Krusty the Clown (Bart’s hero) and their too good to be true next-door neighbour Ned Flanders. The first season of any television series carries a fair bit of pressure. Not only must it achieve good enough ratings for the network to consider green-lighting further seasons, but it has to lay down the foundations for potential future seasons, establishing both characters and its own style. In laying down the foundations for potential future seasons, creator Matt Groening and his team of screenwriters, along with a small voice cast that prove themselves to be tremendously versatile, do a very good job of establishing the characters. Season premiere Simpsons Roasting on an Open Fire establishes that Nuclear Power Plant worker Homer is by no means the sharpest knife in the drawer, while Marge is a loving, if long-suffering, wife and mother, eldest child Bart is by all means the troublemaker, while middle child Lisa highly intelligent and baby Maggie is mute yet expressive. Later episodes flesh out these attributes far more, with Homer’s lack of intelligence coming through in his insensitivity, which regularly frustrates Marge and, at times, puts a strain on their marriage. Bart’s troublemaking ways regularly leave all manner of carnage and destruction in their wake, and Lisa’s high intellect at times leaves her feeling unfilled and unappreciated. In Maggie, however, we can now view Season 1 as a foreshadowing of what would come in later seasons, as she proves herself to be more than a typical infant by befriending a pack of wild grizzly bears in Episode 7 and saving her older siblings from the “Babysitter Bandit” in Episode 13. The screenwriters also do a great job of establishing the personalities and relationship with the Simpson family of a number of supporting characters. These include Homer’s enmity with sisters-in-law Patty and Selma, his love-hate relationship with his curmudgeonly father (Grampa Simpson) and his desire to out-do Ned Flanders; as well as the grouchy yet (deep down) caring personality of bartender Moe, the cold and dictatorial nature of Mr. Burns, Bart’s enmity with Principal Skinner and fear of school bully Nelson. While The Simpsons Season 1 did succeed in establishing characters for future potential seasons, like many first seasons of long-running series, it was less successful in establishing a style and a voice. This partly comes down to the animation – there is a lack of background detail and, although the characters are expressive (with many characters’ default expressions going on to be used for the series’ entire run), like the settings around them they do have quite a rough, somewhat rushed, visual quality. Furthermore, several characters have their physical attributes such as hair or skin colour changed during the season – most notably Smithers, a grey haired African-American in his first appearance, who subsequently became brown haired and yellow-skinned. As for establishing a voice, however, the main issue is the fact that, despite being a sitcom, there is much more focus on drama than there is on comedy, with much of the plotlines centring on either familial relationships or serious issues. 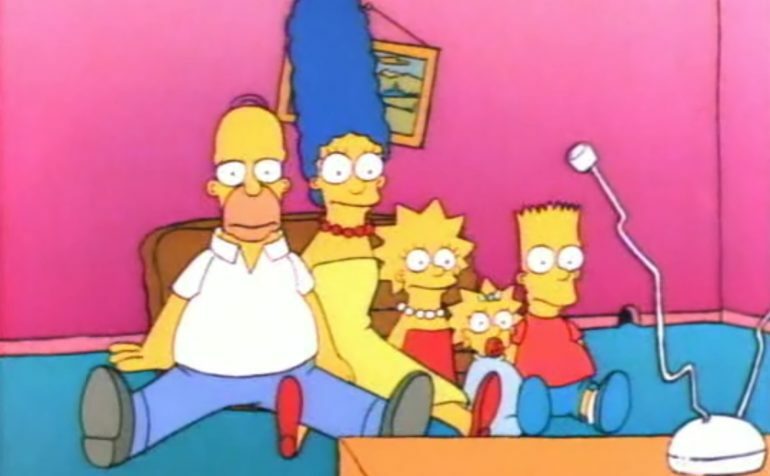 Three of the thirteen self-contained episodes see Homer and Marge’s marriage come under serious strain, while Homer and Lisa each get an episode depicting them as battling depression and one episode sees Bart become the primary target of bully Nelson and his cronies. In short, for a family-based sitcom, The Simpsons Season 1 does veer quite a lot into the territory of soap operas and teen dramas. The drama, however, is generally well written. The usually upbeat Homer’s gradual sinking into an ever-deeper depression during Episode 3 is genuinely heart-breaking to watch, its eventual culmination in a suicide attempt capable of bringing a tear to the eye, foreshadowing a penchant for genuinely emotional, heart-breaking moments that The Simpsons would display sporadically for years to come. That is not to say that the humour is non-existent in this season as, while they may be far sparser than in subsequent seasons, there are still well-written gags in each episode. These range from simple yet humorous verbal gags (like Bart’s inappropriate rendition of Jingle Bells and veiled insulting of Homer’s obesity), to slapstick (such as a chemistry incident and a cherry bomb going off in the toilets) to the hilariously absurd (a brilliantly original scene centred around electric shock therapy). Furthermore, there are some initial attempts at the satire, stereotyping and social commentary that would go on to define The Simpsons for decades to come. They are somewhat few in number, but the writing department manage to satirise the educational system’s approach to gifted children, crooked salesmen and human superstition, as well as pen some quite amusing stereotypes of the French nation and contemporary American convenience store clerks. The best example of social commentary, however, is not a humorous one – rather it is a heartfelt speech by Homer in Episode 10 about the inappropriate objectification of women, which especially resonates today, in the era of the #MeToo movement. Best episode: While there is a generally consistent standard throughout the season, the best episode is probably (by a hair’s breadth) Simpsons Roasting on an Open Fire, the one that started it all. The episode has a very good balance between laugh-out-loud comedy and warm and sincere family drama, while also establishing not only the personalities of the central family, but the roles of Ned Flanders, Patty and Selma, Mr. Burns, Barney and Moe. Best slapstick gag: Slapstick gags have been a staple of cartoons since the Golden Age of Hollywood and The Simpsons is no exception. The best one from Season 1 is in Episode 2 (Bart the Genius), when Bart has a chemistry accident. We see an accident coming from a mile away, but nothing prepares us for just how different and visually ingenious the resultant explosion is. Best guest appearance: In Episode 12 (Krusty Gets Busted), the clown’s sidekick, Sideshow Bob, makes his first speaking appearance and is voiced by none other than Kelsey Grammer. The Cheers star brought a tremendous sense of theatricality and sophistication to Sideshow Bob with his distinctive smooth, baritone voice, a performance so well-received that Grammer continues to make guest appearances as the character to this day. While Season 1 did a good job of establishing both the central family and some of the series’ most prominent supporting characters, rougher animation and greater focus on drama than comedy shows that Matt Groening and the team were still trying to establish their style and voice. Nevertheless, there are good gags, moving character drama, memorable voice performances and hints towards the ingenious satire that The Simpsons would become renowned for, meaning that Season 1 ultimately lay down the foundations for what would go on to become one of the most successful television series’ of all time. When classic cartoons start to clash with our ideas of what is and isn't acceptable, how do we address this? Bad graphics? That’s a paddlin’. Poor collision mesh? That’s a paddlin’. Boring gameplay? Oh, you better believe that’s a paddlin’. Allegations have been swirling around the pop legend for years - but the recent documentary finally made people react.